The National Hurricane Center says "a life-threatening storm surge is now likely" along the North and South Carolina coasts as Hurricane Florence approaches the U.S. eastern seaboard. The center of the storm is expected to hit North Carolina's southern coast by Friday. Even though Florence has weakened to a Category 2 system with winds of 165 km per hour, forecasters say the storm remains a destructive force. "Just because the wind speeds came down and the intensity of this storm came down to a Category 2, please do not let your guard down," Brock Long, the Federal Emergency Management Agency administrator, told reporters Thursday in Washington. Florence is currently moving to the northwest at 17 km per hour. The forecasters say the slow speed will give Florence time to pound the Carolinas with bands of heavy rain. The forecast track has the storm moving slowly along the coast throughout Friday and into Saturday. At last report, the storm was about 180 km east-southeast of Wilmington, North Carolina and about 270 km east of Myrtle Beach, South Carolina. People in the Carolinas had the daytime hours Thursday to complete their final preparations to ride out or escape the storm. By the time the storm leaves the region, forecasters expect that it will have dumped 50 to 70 cm of rain in coastal areas, with some parts possibly being inundated with up to 100 cm. Further inland, rain totals could reach 30 cm in the Carolinas, and up to 24 cm in the rest of the Carolinas and in southwestern Virginia. Forecasters also say the storm surge -- or wall of water -- that the hurricane's winds and forward movement push on shore, could cause normally dry areas to be flooded by up to 4 m of water moving inland. Surges up to 4 m could inundate Cape Fear, North Carolina to Cape Lookout, North Carolina, with smaller surges ranging from half a meter to 3 m in coastal areas from Edisto Beach, South Carolina to coastal areas extending north into North Carolina. Because hurricane force winds extend 130 km from the center, people on land will experience sharply deteriorating conditions long before the center reaches the coast. Some people, such as Jennie, are refusing to heed evacuation warnings. 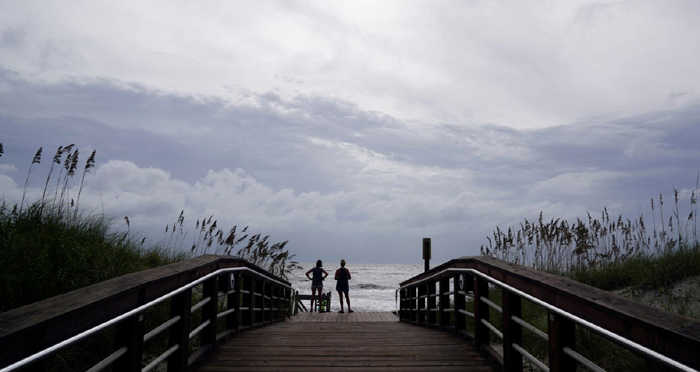 "Leaving is such a problem with the traffic going out," Jennie told VOA Thursday afternoon as she strolled along the shore of Carolina Beach near Wilmington, North Carolina. "But even worse than that is coming back in because you don't know what you're coming back to." Her friend Kate is refusing to evacuate as well because of "the idea of having to leave with my two cats and go somewhere for a week or more. Once you leave, you don't know how many days it will be before you can return," she said. About 10 million people live in areas that have been under either hurricane or tropical storm warnings and watches. Leaders of the states in the path of the storm have warned people all week to evacuate the most susceptible areas. The governors of North Carolina, South Carolina, Virginia and Georgia declared emergencies to help speed up government aid efforts. President Donald Trump said Wednesday that protecting lives is his "absolute highest priority." "We'll handle it. We're ready. We're able," he said. "We're fully prepared. Food, medical, everything you can imagine, we are ready."